The benefits associated with a good night's sleep are endless, yet a significant number of people are not getting enough sleep on a regular basis. There are sleep apps out there to maximize your forty winks and send you happily off to dreamland. But among so many of these apps choosing the most efficient one is not that easy. Because of that, we decided to help and we discovered one great sleep app which is offering you the most amazing sleep soothing sounds. Let’s see what the app is about. What is Mysa all about? 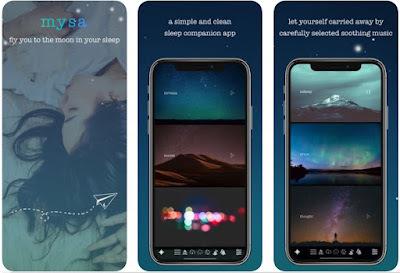 Mysa is a sleep companion app specially developed for iOS users is offering a chance for each user to fight his insomnia issues and improve the quality of his sleeping, bettering his memory and relaxing with the app’s incredible selection of sleep soothing sounds. Users can use the app before they go to sleep from 30 minutes to 60 minutes for 3 weeks, bettering their sleep issues and getting a good night sleep. Users will fall asleep faster and more relaxed with these sleep relaxing melodies. All the features offered on this companion sleep are the app is quite helpful and efficient, offering the user a chance to get his sleep quality to the next level, become more relaxed and fight insomnia. The app is with simple and clean design, offering the most quality carefully selected sleep relaxing melodies with the most gorgeous immersive natural sounds that can mix and match so the user can get the whole relaxing experience. On the app, the user has the chance depending on his needs and preferences to choose the sleep melody duration from 15 minutes to 10 hours. Carrying the user away with the sleep relaxing sounds the app will make the user feel more relaxed and get a good night sleep. Users can use the app to get a better sleep, for naps or as a time dedicated for them to relax as the app is the companion for all of this. The app is allowing users to even send feedbacks about their experience. Download it now on App Store for free to improve your sleep quality with sleep relaxing melodies!